Description: Joy Malone learns this the night she sees a stranger with all-black eyes across a crowded room—right before the mystery boy tries to cut out her eye. Instead, the wound accidentally marks her as property of Indelible Ink, and this dangerous mistake thrusts Joy into an incomprehensible world—a world of monsters at the window, glowing girls on the doorstep, and a life that will never be the same. Indelible was an interesting read. The concept behind the world of the Twixt is incredibly unique and novel and quite different from anything I have read. Dawn Metcalf has created a story that is twisty, dark and haunting. It’s imaginative and filled with creatures and illusions that you would expect to find in your nightmares. Overall a solid dark fantasy read I would recommend to those wanting to read something out of the ordinary. 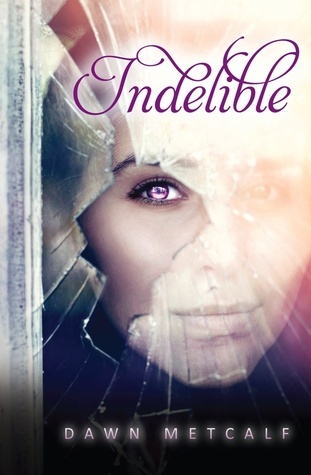 Indelible is about the hidden world of the Twixt. Joy is out dancing with her friend when she notices a mysterious guy named Ink. This mysterious guy attacks Joy and stabs her in her eye. Instead of blinding her, he marks her as his property and she becomes his significant other. With his mark, Joy becomes part of the Twixt world and is swept into the chaos of monstors, traps and symbols. To survive she has to pretend to be Ink’s chosen one. The story moves at a fast pace and is filled with plenty of action. One of the things I loved about this book was that the action was unpredictable. I never knew what was going to happen next and what creepy creature was going to appear to wreak havoc. There were many gorgeously sinister monsters and creatures that live in the world of the Twixt. Metcalf does not shy away from the crazy and the hair-raising horrors of this world but instead highlights the creepy. The book does not sugarcoat the consequences of living in a world full of monstors and these characters suffer plenty of pain. Though the book deals with a lot of fantasy elements it also has a contemporary side. Joy deals with a lot of personal stuff with her family. There were very realistic familial relationships represented in this book, which was a nice change to some YA books where parents are not as present. Joy is a character that does not give up. She gets thrown into chaos and terrible things keep happening to her but never once does she give up. She picks her self up and keeps going. She was very admirable that way. Ink was a very noble soul. He had a very antiquated way of talking without contractions, which made his dialogue unique and charming at the same time. The romance between Joy and Ink was sweet but happened a bit too fast for my taste. Inq was a very entertaining flamboyant character. She was very different from Ink and acted more human than some of the Folk, making her more relatable. Monica was a great supportive best friend and you knew that she was really looking out for Joy. I did have a few minor issues with this book. The world building was quite complicated and because of this I was a bit confused on some of the aspects of the story. The story has two main characters with the same name (Ink and Inq) and sometimes it took a bit to figure out which character the book was referring to. My advice would be to be patient with this book because it takes a while to really understand the world. 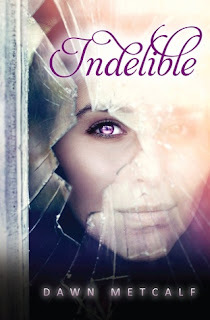 Indelible is a good fantasy read. The story ends with so much possibility for the sequel to explore. I am looking forward to reading the sequel. It will be interesting to find out what happens next for Joy and Ink.